I found the black tor upon which I had seen the solitary watcher, and from its craggy summit I looked out myself across the melancholy downs. Rain squalls drifted across their russet face, and the heavy, slate-coloured clouds hung low over the landscape, trailing in gray wreaths down the sides of the fantastic hills. In the distant hollow on the left, half hidden by the mist, the two thin towers of Baskerville Hall rose above the trees. They were the only signs of human life which I could see, save only those prehistoric huts which lay thickly upon the slopes of the hills. Nowhere was there any trace of that lonely man whom I had seen on the same spot two nights before. Alright, it is 1901 and it has been 8 years since the last Holmes story. Eight years since Holmes and Professor Moriarty had their epic stand-off at the Reichenbach Falls. A new century has dawned. The Victorian Era has come to an end. The new era is about to bring some uncertainty mixed with excitement and signs of a break with Victorian values are already on the horizon – the first electrical vacuum cleaner is being patented, the first ocean liner is equipped with wireless technology, colonialism starts to be questioned following the end of the Boxer rebellion, the socialist movement in the UK starts to form into a political party, and the British governments is being criticised over its treatment of civilians in the Boer Wars. Change is happening. Even though ACD’s earlier Holmes stories carried some remarkably modern attitudes, The Hound of the Baskervilles does not reflect on any of this. Instead, his first return to Holmes throws us way back into a Gothic tale set firmly in Victorian England, thriving on myths and superstitions, and taking place well away from any images of modernism – we get to visit Dartmoor, that remote swampy area in Devonshire that is so different from the hustle and bustle of turn-of-the-century London that is almost an exotic choice of setting. “Caught cold, Watson?” said he. 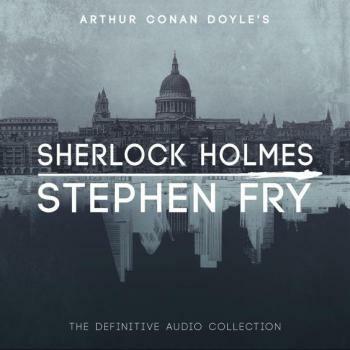 After an absence of 8 years, ACD picked up where he left off every Holmes story that had gone before, with both of them at 221B. How odd it must have been to have read this story at the time of publication. Holmes had died, and yet, we have another story. Were fans delighted with the publication of Hound of the Baskervilles, or were they reminded of Holmes’ sad demise? Part of the benefit of re-reading these stories is to think about these aspects. Part of the unmeasurable joy in re-reading the stories with an enthusiastic reading buddy, is to know that others have these questions, too! But never mind about the issues that the audience in ACD’s time might have had, for me Hound was one of my first introductions to the canon (together with The Speckled Band), and I love it. I mean, what’s not to love about Holmes and Watson? In The Hound of the Baskervilles we have another adventure of the two, but unlike in other stories, Watson takes centre stage for a lot of the story. There is nothing wrong with that, of course. Given that this was published when Holmes was believed to be dead, it may even make sense to have Holmes fly in and out like a spectre. Also, this story, like all of them, lives off the chemistry between the two characters. I am not going to give away any of the plot here, but there is a certain scene in Chapter 12 that I love best of all of the story. Although, I have to admit, the idea of a lepidopterist chasing across the Dartmoor moors with a butterfly net also appeals to my sense of whimsy. Anyway, this story is not about butterflies. It’s about a hound and boots and murder, and I loved it. But there is more to it, too. In a closer reading, ACD does bring up questions of nature v. nurture, of inherited evil, of the power of suggestion, superstitions, the question of mental capacity in criminals, and the treatment of prisoners. Much more than in the short stories, ACD portrays a cross section of society in this story, and shows that society in remote places can be as varied as any major city and at the same time suffer from from the same issues. It still is one of the books that I can re-read without getting bored. What’s more, in my favourite adaptation, the producers took some liberties with my favourite scene – not the one with the lepidopterist – and added it this absolute gem – Holmes cooking! I know, I should have saved this for the Sunday Soup post, but I didn’t want to spoil people’s appetite.